I love trying new teas, and am delighted to get a chance to sample the latest launch from Les Palais des Thes. They recently announced their Plaisirs Purs range, a collection of four blends which present a simple yet very appealing idea – classic teas paired with the natural extracts of fruits and flowers in four flavors: “le citron” (lemon), “la poire” (pear), “la fleur d’oranger” (orange blossom) and “la menthe glaciale” (frosty mint). I haven’t had a chance to try all four flavors, but here’s an initial impression. Rediscover the classic fragrances of tea with our lemon tea! Discover a tea scented with a unique fragrance taken directly from nature: lemon. This tea associates the zesty fragrances of sun-ripened lemons with the round aromas of a black tea, Orange Pekoe, from Sri Lanka. A fresh and zingy blend! Steep 4-5 minutes at 205 degrees fahrenheit / 95 degrees celsius. This tea makes a memorable first impression with a punch of bright, strong lemon. The tea leaves are dark with large, evenly sized, coarse pieces. The scattering of petals throughout the tea add to its distinctive and pretty appearance. 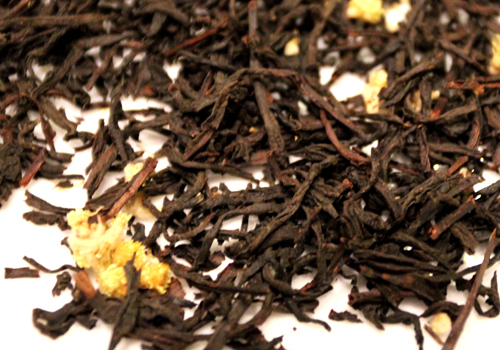 Black tea grounds the lemon flavor quite nicely in the steeped tea, adding a mellow undertone and full body which balances out the zingy, citrusy flavor from the lemon. For those of you who expect this to approximate the taste of a squeeze of lemon into a strong black cup of tea, it’s not quite that but a good alternative in its own right. The tea is quite pleasant and soothing, without any acidity to the cup. This tea can be purchased on the Les Palais des Thes website here.